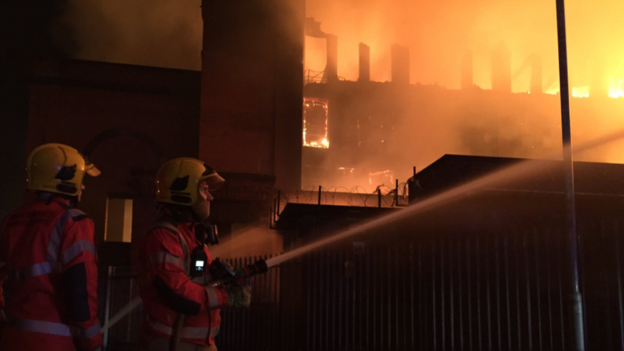 MANCHESTER (UK) – On thursday night a fire start in the Maple Mill paper factory, in Cardwell street, Manchester. At least 100 homes were evacuated by the Great Manchester Fire Brigade. Hundreds of peopole are waiting the prosecution of the operations. 70 firefighters are controlling the blaze, which is described as a “major incident”. The Maple Mill was also on fire 3 months ago. Witnesses saw flames leap up to 200ft (60m) and said the front of the building had collapsed. No firefighters have yet been able to enter the building as thick smoke engulfs the area. The Fire Brigade are using a special platform to stop fire with a remote control. A emergency “rest centre” has been set up in the nearby Honeywell Centre for those residents evacuated from their homes. Shortly after 4am this morning the fire service was called to a fire in a mill in Cardwell Street in Oldham. 10 fire engines along with support vehicles including a command support unit, high volume pump and hose layer are in attendance at the incident. About 80 fire fighters and officers are at the scene tackling the fire which involves a four story industrial building. Parts of the structure have collapsed and the whole building is engulfed by the fire. Firefighters are attacking the fire with jets, pumping water from nearby open water sources and are attacking the fire from the outside of the building. Area Manager Warren Pickstone said: “Crews are working incredibly hard to tackle this fire, when we arrived we were met with a serious fire on the top floor of the mill. We are working hard with our colleagues at the police to protect surrounding properties, about 100 properties in the immediate area have been evacuated. We anticipate this incident to continue for a number of hours.